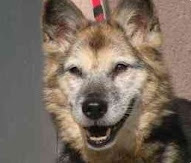 This posts kicks off a series on the benefits of adopting and owning senior dogs. I'd still like to hear from all of you and your experiences with older pooches, but I wanted to explain to those of you on the fence about adopting that there are a lot of great reasons why they should take the plunge. Conversely, I'll also be launching a series discussing the challenges of taking care of canines as they reach their golden years. The benefits far outweigh the challenges, but I wanted to make sure that everyone had both sides of the story. Check under "benefits" and "challenges" topics links to your left. If you've seen it once, you've seen it a million times on ads for senior dogs: "already housebroken." Like any of these benefits, your mileage may vary; however not chasing around puppies who haven't figured out proper bathroom etiquette is pretty cool in my book. Early on after taking in an older dog, it's always good to make sure that the dog understands that you're there to work with him or her on this most important aspect of their hygiene. Taking them out and finding a few regular places to go helps, as well as working in a few extra trips during the early days of your relationship, so as to not encourage accidents brought about by making your new pal wait too long. Every older dog that has had a different way of communicating that it wanted to go out. Going to the door or window, jumping around, grabbing a leash off the door handle, and laying in front of the DVR are just a few of the tricks that have been pulled on me. I'd love to hear if some of your senior pooches have other inventive means of communicating at their disposal. Once you're out there on the trail looking and have found that primo location, I find that it helps future issues, if you reinforce your senior pup's good deed. I usually congratulate Rusty by telling he found "good spot." He loves to walk and walk (and walk and walk and walk), so if I want him to take care of his business first, I'll tell him "Hey, that looks like a good spot," which is starting to work out pretty well on most occasions. This little trick is fantastic on rainy days when you don't want to go to far from home and don't have a yard that you can send the pooch to answer nature's call. Consistency is the key here. Sleeping in one day, or not listening to your dog could undo all of the trust that you've built up. I find that most dogs want to do the right thing and would rather not soil where they live, so stay alert. I'll cover the darker side of this topic in a future "challenges" post, including those times when you're dog is into marking it's new territory (aka your living room) or issues with holding it in as they reach more a more advanced age.